Hook Set Tackle Co. is a small family business. Hook Set Tackle manufactures and sells some of the most proven artificial baits on the market. With all the new things on the market today it is a bit overwhelming for the fisherman. Manufacturers are making baits eye appealing to the fisherman much the way the auto industry does for consumers. We at Hook Set Tackle make and sell some of the most proven baits on the water, baits that do one thing, and do it well, catch fish! Shad Slab Wobble Spoons and Dart Devil Spoons have caught many Crappie, Walleye, White Bass, and Wipers and done so at an affordable price. Leadhead jigs and soft plastic tube baits have caught millions of Crappie. We sell the Super Jig soft plastic tubes. The Super Jig is the one in our tackle boxes for one reason, they flat catch fish! The jigheads we sell are made by us using premium quality hooks and are checked for quality by hand one at a time to ensure the barb will hold whatever soft plastic bait you use. All spoons are made with components supplied by American companies and are assembled by our family. NOT OVERSEAS! Shad Slab Wobble Spoons , Dart Devil Spoons, and a new leadhead we make and named the Cobra Head Jig are just a few of the products we manufacture. 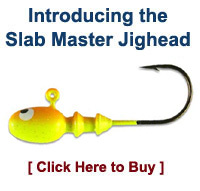 The Cobra Head Jig is a very effective jighead for all fishing. 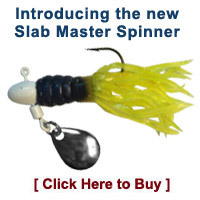 The head design lets it rock and wobble when trolled or casted. When fished for Walleye this design holds the hook up for better hook presentation. We have new baits on the design table and are always striving to produce baits the fish will hit. Because that's what it's all about, catching fish. Shop our site and if you don't see what you are looking for let us know and if we can't get them for you we will let you know where to find them. We are here for the fisherman to help you fill your livewells. Thanks from the whole Kershaw family.